Here’s your average looking IP packet encapsulated in an Ethernet Header. For the sake of conversation, I’ll assume going forward that we are referring to TCP only but I did put the UDP header length in there just for reference. So a standard IP packet is 1500 bytes long. There’s 20 bytes for the IP header, 20 bytes for the TCP header, leaving 1460 bytes for the data payload. This does not include the 18 bytes of Ethernet headers and FCS that surround the IP packet. The MTU is defined as the maximum length of data that can be transmitted by a protocol in one instance. What makes this slightly confusing is that the MTU does NOT include the Ethernet headers required to transmit the packet on Ethernet, it only includes the IP packet information. That is, with regards to MTU, we always assume the Ethernet interface is already taking into account the 18 bytes of Ethernet headers (sometimes we don’t even see the FCS so its 1514 not 1518). So this is pretty straight forward, nothing too exciting here. The majority of networks assume an MTU of 1500 bytes and everything works as expected. MSS is slightly different because it is determined by each end of the TCP connection. During session setup a device can specify the MSS they want to use in their SYN packet. However, the devices technically do not need to agree on an MSS and each device can use a different MSS value. The only requirement is that the sending device must limit the size of the data it sends to the MSS it receives from it’s peer. MSS is generally 40 bytes less than MTU to accommodate for a 20 byte IP header and a 20 byte TCP header. 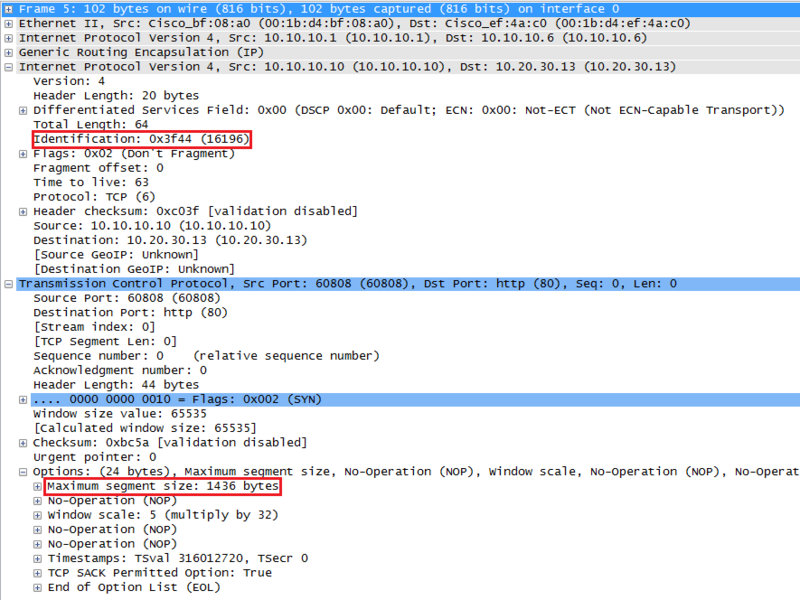 Note: If you’re using Cisco routers as your end points like I am in my lab, you should be aware that in some code versions TCP sessions generated or terminated on a router use different MSS. For local connections (same subnet) the default MSS is 1460. For routed connections, the default MSS was 536. To make things more ‘normal’ I set the router MSS to 1500 with ‘ip tcp mss 1500’ in global config mode. Right, so things are working as we expect. So let’s take a moment to talk about the difference between MTU and ‘IP MTU’ on a Cisco router. You might have noticed that under interface configuration you can set either. The difference is simple but sometimes not as easy to understand. MTU sets the physical interface MTU, that is the max packet size supported by an interface. IP MTU sets the max size of an IP packet. So there, clear enough for you? The problem here is that we’re all used to working with just IP packets, however, that’s not always the case. So the real difference here is between setting the max MTU for any protocol on the interface, and setting the max IP MTU. I like to think of MTU as being the hardware MTU and the IP MTU as being the IP packet MTU. By default these values are the same so IP MTU never shows up in the config. Also – this should be obvious, but the IP MTU has to be equal or less than the MTU. It complains, this is expected and makes total sense. Now let’s set the IP MTU to 1100..
We can see that the running config now shows the MTU and IP MTU since they are difference values. A ‘show int fa0/0’ will show the interface (hardware) MTU of 1200 and a ‘show ip interface fa0/0’ will show the IP MTU of 1100 in this case. So now let’s talk about why any of this matters. If you consider a network where each link has a IP MTU of 1500, you only ever need to worry about this if you’re doing tunneling (or any other encap). Note: MPLS is a whole different animal, I’m not covering that in this post but I’d argue that it’s a tunnel all the same. So in our example so far, the end devices have been the device sorting out the issue caused my the GRE tunnel. However, it’s not always best practice to let the endpoints do this because PMTU discovery relies on ICMP. For instance, I can very easily break this connection by disabling ICMP unreachable messages on the interface facing the server. Note: If you’re testing this out yourself make sure you clear out the servers route cache. As mentioned before, it will cache the lower MTU for a period of time so it doesn’t need to do PMTU constantly. 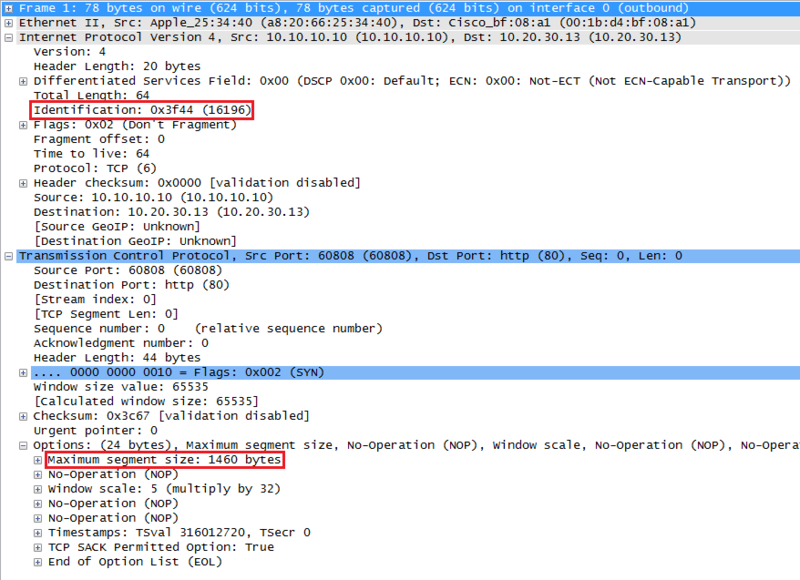 Command – ‘ip route flush cache’. It fails. Without the router telling the server there’s an issue, we can’t pass traffic. There are a couple other ways to take care of this. One would be to let the routers fragment the traffic by clearing the DF bit on the traffic. I think that’s a horrible idea so I won’t even take the time to discuss it. The second option it to use what’s referred to as ‘TCP clamping’. I flagged the IP ID as well so you can see we’re looking at the same packet. We’re just analyzing the same packet at different points in the network. As you can see, the ‘middle’ of the network has very little to do with MTU and MSS. Like most network things, you need to ensure that you’ve accounted for any additional headers at the edge so devices in the middle don’t need to respond or do crazy things. 1 – Client initiates TCP session with Super Computer, sets MSS to 1460 by default. Device A changes MSS to 1436 before the traffic enters the tunnel. 2 – Server replies in his SYN/ACK with an MSS of 1460. Device B changes the MSS to 1436 before the traffic enters the tunnel. 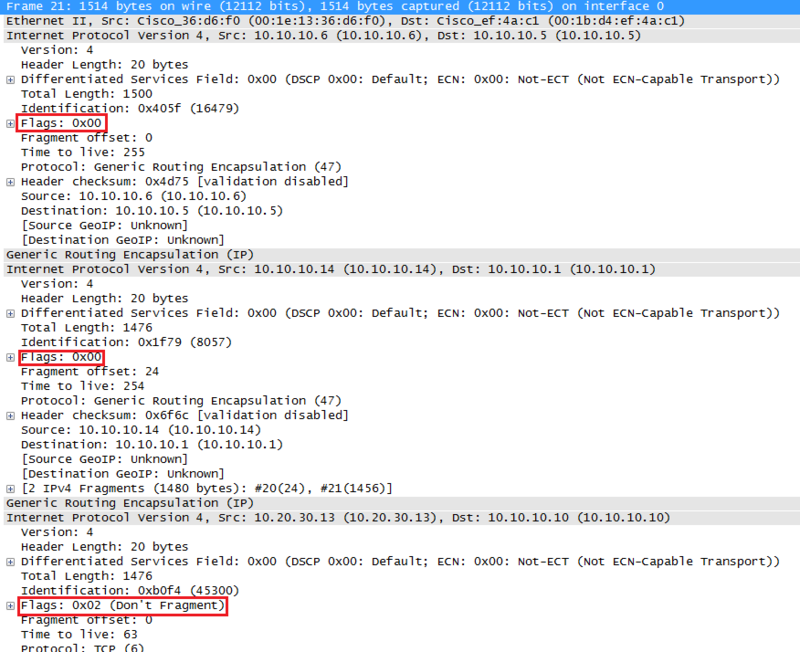 3 – The TCP session is setup, each side thinks the other side has an MSS of 1436. 4 – When data starts flowing the packet size is exactly 1500 bytes when it reaches the Cloud-2 router. Cloud-2 knows that it has to put an additional 24 bytes of headers on the packet which puts it over the MTU for it’s interface facing Cloud-1. It’s only option at this point is to fragment the traffic. 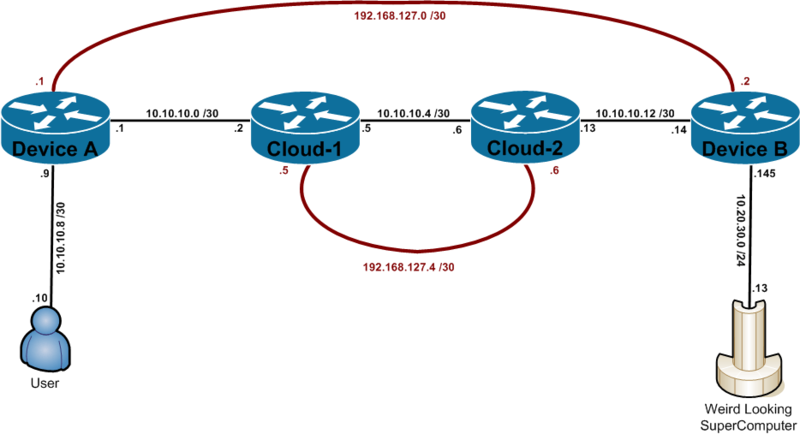 5 – Cloud-2 receives two packets which happen to be fragmented but it doesn’t much care (or know) and happily forwards them along. The math all works out to support this. We can see a 1514 byte packet and a 82 byte packet being sent. The 1514 byte packet is the max that Cloud-2 can send so it sends the rest of the data in a second packet. The second packet consists of an IP header (20 bytes), a GRE header (4 bytes), an inner IP header (20 bytes), and 24 bytes of payload (our overflow from packet 1). Added all together it gives you 68 and you can add in 14 bytes for the Ethernet header giving you 82 bytes total. So how do we fix this? Same thing we did before, just lower the edge MSS by another 24 bytes to accommodate the additional headers that cloud-1 and cloud-2 are using for their GRE tunnel. So there you have it. That was a nice refresher for me. Hope you enjoyed as well! Thank you for the detailed explanation – I look forward to many more of the same! A tiny point – your router diagram uses /32 subnets – I think you meant to use /30. Fixed! Thanks for reading and the feedback! One of the most detailed articles on this important but easily overlooked topic. THANKS A TON!!! Spotted one error though in here – “To make things more ‘normal’ I set the router MSS to 1500 with ‘ip tcp mss 1500’ in global config mode. “, I think you meant ip tcp mtu 1500? Thanks for reading! In this case, I was talking about specifically the MSS command since I was talking about traffic generated from the router. Does that make sense? Great Explanation with Superb diagrams!!! Shouldn’t Device A receive a single packet since the Cloud GRE headers are stripped off once the pkt exits the Cloud environment? Also, you mean Cloud-1 in “point 5” ?!? Thank you very much for such easy and perfect explanation of MTU and MSS. I have one doubt that what is server is on WAN and we are tried to access from LAN and it is not accessible but if we change the MSS/MTU value it is accessible so what could be the possible reason for changing it. Thanks a TON, nice and detailed explanation. Awesome…!! !I haven’t got this much detailed explanation in any other website. Great Job..:)Thanks a million. Can you expand on why you would NEED to set an ip mtu statement on an interface? Wouldn’t the ip tcp adjust mss value be enough to handle all tcp flows by specifying the max payload, thus coming to the specified IP MTU automatically? Ive seen articles detailing typical configurations where the ip mtu is filled in with a 40 bytes extra for the header (along with tcp adjust), but it seems kinda “redundant” to me? I’d like to know too ?!! Quick question for a MSS and a MTU. When i met a fragmentation issue, i normally changed a MTU instead a MSS. But when i met a fragmentation issue (and not allow PMTU) on the IPSec tunnel(site to site), I needed to change the MSS value using the following command for fixing the issue. I thought that if i change a MTU from 1500(default) to 1400, a MSS also will reduced. But the changed MTU was not fix this issue and the issue was fixed after change MSS value. What is different changing the MSS instead of the MTU? So you’re saying that modifying the MTU of the interface didnt help? But lowering the MSS with netfilter rules helped? That’s strange. MTU is sort of like the global setting. Many times if we dont have the expertise or the ability to change the MSS we end up doing a quick fix by lowering the MTU. Howe were you changing the MTU? Was it on the server itself? Also – as a quick FYI it looks like your changing the MSS in netfilter. We often find its easier to change it as part of the route configuration. That saves quite a bit of time and complication. Thank you !! This is one hell of an explanation.. Got the right thing. Keep posting !! But Can you expand on why you would NEED to set an ip mtu statement on an interface? Shouldn’t Device A receive a single packet since the Cloud GRE headers are stripped off once the pkt exits the Cloud environment(Cloud-1 exist interface towards Device-A)? Thank you for your exhaustive explanation. Really informative and interesting. In the breakdown section you mentioned in point 1 that Device A changes the MSS to 1436. Does that mean you also used the command that was described for Router B on Router A (MSS to 1436)? In the breakdown step 2 you said the device replies with MSS1460. I thought the Webserver replies with a value equal or less than the advertised MSS from point 1 (1436). It would be great if you could clarify the issue. Great article with lots of interesting information. I really like the depth of this article. I stumbled accross some points. In the breakdown section you mention in Point 1 that Device A changes the MSS to 1436 before the traffic enters the tunnel. In the description above you say: “Let’s configure it on our router interface that we also disabled ‘ip unreachables’ on…” Above that was a screenshot of Router B. 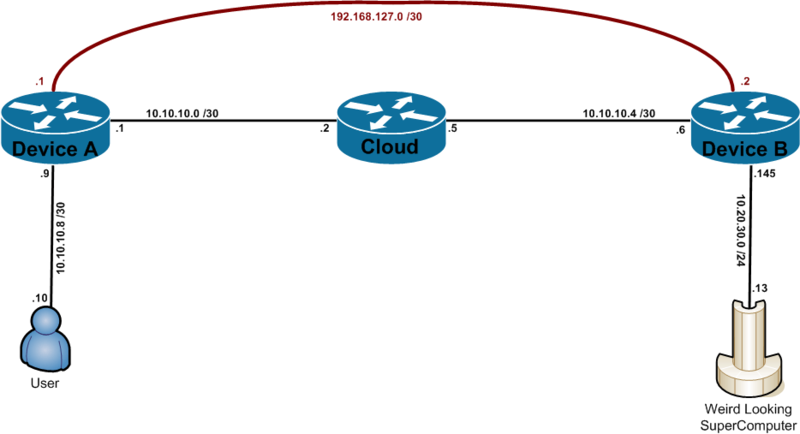 If I am not mistaken, the MSS adjust 1436 should be configured on both Router A and B, right? In the breakdown section at Point 2 you say that the Server replies in his SYN/ACK with an MSS of 1460. 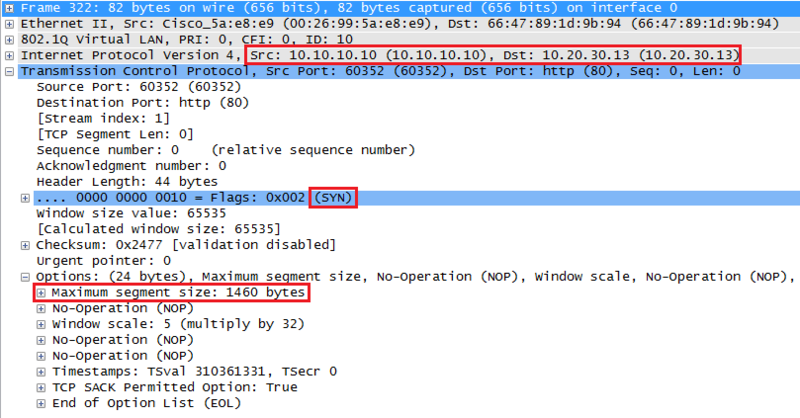 I read that if the router has the MSS 1436 configured on it’s interface it looks for SYN packets which are either ingress or egress on that router interface and automatically changes the MSS to its configured value. Therefore from my understanding, it should be that the router in that case Router B changes the MSS of the incoming SYN Packet to aMSS of 1436 or lower and that the SYN/ACK package is sent out with an MSS of <=1436 and not 1460. Really nice article and well laid out, I went through it few times.. I have just a generic question , if you could drop me a line. I have a small lab with two servers, runs VM’s on both connected to a standard Netgear router (only UI access). I really wanted to try some of these myself, do you mind suggesting any good cisco switches/routers so I can work on the consoles more than on UI itself – kept searching in google and not sure based on your experience what would be cost effective yet good ones to buy in for home lab setups.